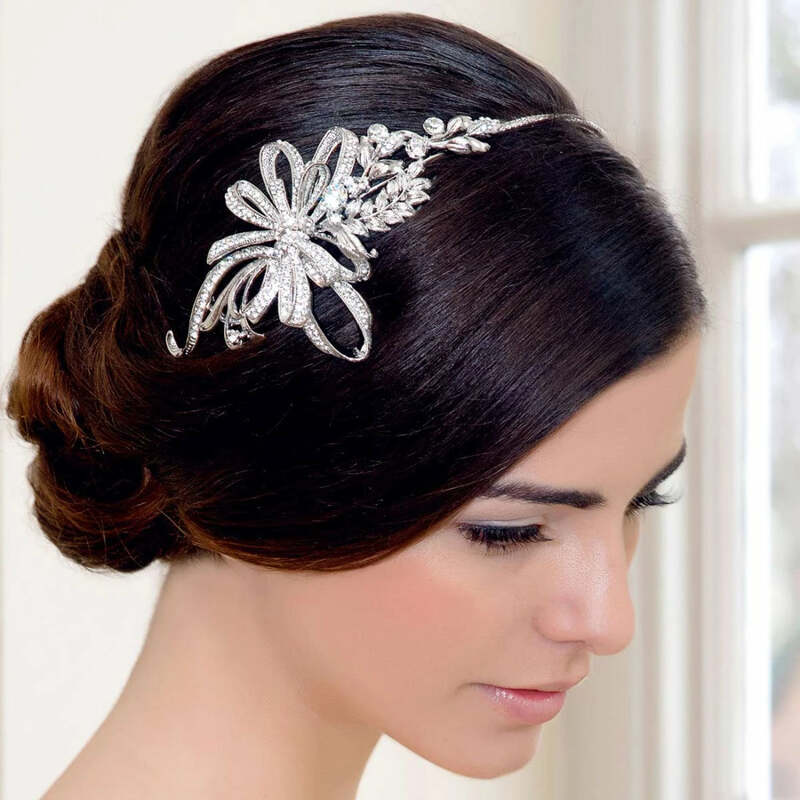 A beautifully delicate statement side tiara adorned with bows, ribbons and leaves for breathtaking style. An exquisite piece easy to mistake for a precious heirloom lovingly handed down through the generations, our Treasure of Beauty Side Tiara is simply exquisite. 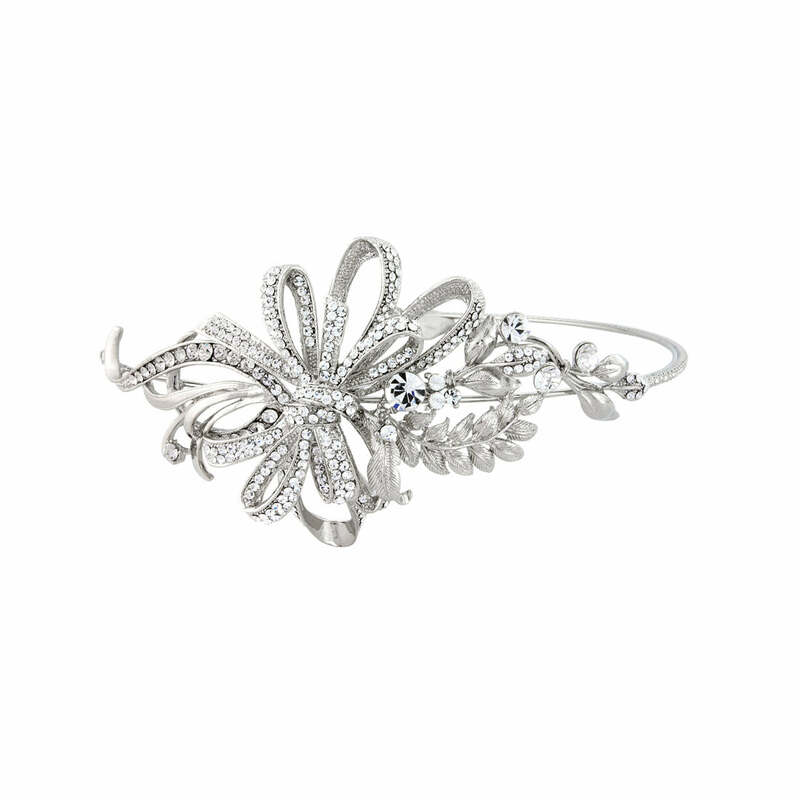 Featuring a side adornment of multi looped bows and trailing ribbons encrusted with sparkling clear Austrian crystals with silver tone leaf accents, the band beyond is encrusted with crystals for delicate sparkle. With side hoops to secure to the hair with kirby grips, this divine leaf and bow side tiara looks timeless set in a variety of up-dos from a romantic low side bun to an elegant French pleat. Brides who adore vintage wedding accessories worthy of heirloom status are sure to fall in love with Treasure of Beauty. Complete your bridal look with a pair of simple earrings and a bracelet for charming vintage class. This side tiara is absolutely stunning !. Well made and looks really expensive. The only critique I have is that it’s hard to fix in place. I'll absolutely save it as a keepsake for my daughter. This side tiara is absolutely stunning! I would call it a timeless classic!! Love it and can't wait to wear it on my wedding day in October. Fantastic website, by far the best collection I have seen.